Allow me to share my thoughts on Crush Gear, Battle of Toy Cars. Rare in anime, but 90% of the main characters are cocky asses. Kyousuke is very inch and cocky, the shrimpy kind that thinks he's pro because he knows more about cars than you. Kuroudo is prideful and cocky. He hates to lose because losing is traumatizing to his pride. Takeshi is super cocky because he thinks he's the strongest. He's the kind that always look down on you as a noob until you defeat him. So in this anime, Kouya is the noob beginner that need to keep up to the abilities of everyone else. He becomes a crybaby when he loses a battle he thinks will win. But it is always the noob that works the hardest. On a occasion, Kouya ripped his hand ligaments when launching the car to have more thrusting speed. His hand was wrapped in bandages later. Every match is a real challenge so there's no way he can be cocky. Aside from the characters, the battles were really good. Losing car sometimes gets smashed up bad, there is no mercy in this anime. 100 X rougher than Beyblade. This is one heck of a anime. Dudes this is my first review so please go easy on me. ^^ I have watched Pokemon and I have watched Yu-Gi-Oh, but Crush Gear is different. Cause after watching Pokemon, I never got the feeling of wanting to own my own real life Pokemon, opinions vary among people here, but not me. I like Pokemon, but a real life Pokemon partner is too much. Maybe use them to do work as workers, or fantasize going to Pokemon world, but never to bring life-sized Pokemon to real world. Hope I'm not being too confusing :P Same thing with Yu-Gi-Oh. I mean maybe some people want Duel Monsters in real life, but they're just going to be holograms and it looks more amazing in anime. Besides it's kinda stupid if an epic monster in real life is for games ^^ Crush Gear is different because after seeing the anime, I wanted one of those epic life-sized Crush Gear cars for real life. Not as toys, but size of real cars. Drive around and maybe cause some destruction. Or maybe take it for a high speed drive in the empty desert and smash some rocks. Or maybe have real life Crush Gear fights, but that would be dangerous so not a good idea. Crush Gear was just so appealing to me it went into my imagination. Can't say Snippy is wrong haha, Interesting characters that partner together for teamwork. 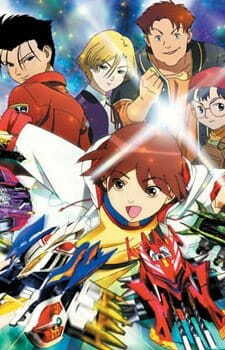 But this is not only a toy car anime. This is a masterful anime in all aspects. Opening song by JAM. Vivid art and car battles. Made from that long ago, there is so much detail in the cars. Lots of jazz and fancywork present in fights. Crush Gear you shouldn't miss this at all. Ok now I talk about my personal preferences. Before I begin, I let you know, the equipped weapons are at the front of a car. My favorite would be Kuroudo's car. It has a spinning drill as a weapon that would pierce, and sizzle down anything on impact. The drill's long, thin, high speed spinning shape is a puncturing force. Second would be Kyousuke's car. It has two weapons, a pair of double, razor sharp spinning sawblades that would slice and mow anything down, Kyousuke's car is the most epic car! Kouya's car for the weapon is a sword, the car itself is a knight design, His car has the weakest weapon, no match for the others whose are much stronger. But I must say though, Kouya's car has the best wheels. This is a long series with 68 episodes focusing much on the much noob Tobita team. Kouya wants to revive the Tobita club, and although he's not bad, he's a brat, noob, and underachiever. The better player he recruits, Kuroudo, Kyousuke, both who are no shows at training, would abandon Kouya at times, and at times too I wish they would stick with that. In battle, the 2 of them are far more interesting than Kouya, but its still a shame though when facing stronger opponents, they would win by outmaneuvering rather than hitting head on. That's why I root for Takeshi because of his OPness. Only Takeshi's car Gaiki shows that much raw power with his steamroller car hitting head on and destroying. He needs more screentime to replace Kouya, it would only strengthen the show and make for a super good battle.